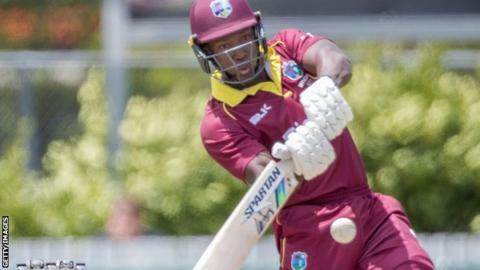 Rovman Powell's century helped West Indies defeat Ireland by 52 runs to secure a Super Six spot at the World Cup qualifier series in Zimbabwe. Powell's 101 saw West Indies recover from 83-5 with captain Jason Holder hitting 54 as they reached 257-8. The Irish will book a Super Six spot by beating United Arab Emirates on Monday. Coming in at number seven, with his team 83-5 having been 58-4, Powell hit seven fours and seven sixes in a superb 100-ball innings. Powell put on 86 with captain Holder and 60 with tail-ender Ashley Nurse before holing out with two balls remaining. Tim Murtagh produced impressive bowling figures of 4-41 with spinner Andy McBrine also taking two dismissals but the Irish were left to rue Powell's big knock after the Windies had been in some trouble. In Ireland's reply, Roach dismissed Paul Stirling and Andrew Balbirnie after Porterfield's duck to leave the Irish struggling on 32-3. Joyce's 63-run partnership with Niall O'Brien steadied the Irish innings before the wicket-keeper holed out near the boundary to Evin Lewis off a Williams delivery for 34. A repeat of Ireland's World Cup 2015 win over the Windies looked possible as Joyce and Kevin O'Brien scored freely but Roach dismissed both of them in the 37th over as Ireland were eventually dismissed for 205 in the 47th over. "We seemed in a good position, but we didn't take some of our chances which can cost you in big games," said Irish skipper Porterfield. "Every game is important. The UAE game on Monday - it's two points up for grabs that we can then carry through to Super Sixes." Ireland defeated the Netherlands and Papua New Guinea in their first two games while the Windies earned opening victories over United Arab Emirates and Papua New Guinea.